The Federal Government has released a new coin and stamp to recognise the contribution of Australia’s ‘volunteer army’. Above: The commemorative to mark the 10th anniversary of the United Nations International Year of Volunteers. 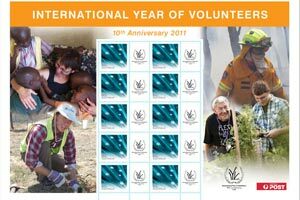 The Government has released the commemorative stamp and coin as part of the celebrations to mark the 10th anniversary of the United Nations International Year of Volunteers (IYV+10),. The coin features a ring of volunteers around the outside edge wile the centre of the coin features the ITV+10 logo. The Government says the new collectable 20 cent coin is designed to remind all Australians of the significant role that volunteers play in local communities. About five million 20 cent pieces are being made and will be seen in circulation in the coming months. Rolled collectible coins are available from the Mint for $14.00 each. The Federal Government has announced that 4,600 Not for Profit organisations will receive Volunteer Grants of up to $5000. For more information about the new coin please visit www.ramint.gov.au or contact the Royal Australian Mint Call Centre on 1300 652 020.